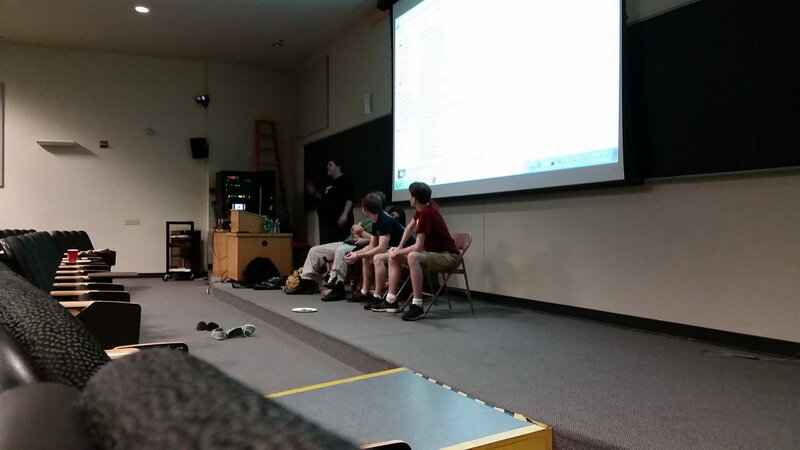 The key events of each semester for our club are the Film Fest and the Gaming Fundraiser which we hold in both the fall and spring semesters. The Film Fest usually encompasses the club coming together to watch a variety of anime, live-action series, movies, and play video games from 10:00 a.m. - 5:30 p.m. on a selected Saturday or Sunday in either Centennial Hall or the Kehr Union. The Film Fest is free, open to the public, and snacks are provided. This also serves as the primary fundraiser for the club, with an anime sale and "member volunteer service auction" sale occurring during the event. The Gaming Fundraiser usually encompasses the club coming together to play video games from 10:00 a.m. - 5:30 p.m. on a selected Saturday or Sunday in either Centennial Hall or the Kehr Union. Free gaming occurs on several consoles while tournaments that charge a minor entry fee are scheduled with the winner receiving a prize. Proceeds from the event are either used as a club fundraiser or are donated to an charity. All activities at these events are thanks to our members and the donations of equipment, games, and anime. The Fall 2018 fest was held on Saturday October 27th, 2018 from 12:00 Noon until 8:00 p.m. on the 2nd Floor of Centennial Hall. This year's Fall Film Fest was part of a larger event with the Bloomsburg University Science Fiction Club known as O3: Oddly Outlandish Oktoberfest. The Fall 2017 fest was held on Saturday October 28th, 2017 from 11:30 a.m. until 8:30 p.m. on the 2nd Floor of Centennial Hall. This year's Fall Film Fest was part of a larger event with the Bloomsburg University Science Fiction Club known as O3: Oddly Outlandish Oktoberfest. The Fall 2016 fest was held on Saturday October 8th, 2016 from 11:30 a.m. until 8:30 p.m. on the 2nd Floor of Centennial Hall. This year's Fall Film Fest was part of a larger event with the Bloomsburg University Science Fiction Club known as O3: Oddly Outlandish Oktoberfest. The Fall 2015 fest was held on Saturday October 20th, 2015 from 11:30 a.m. until 8:00 p.m. on the 2nd Floor of Centennial Hall. This year's Fall Film Fest was part of a larger event with the Bloomsburg University Science Fiction Club known as O3: Oddly Outlandish Oktoberfest. 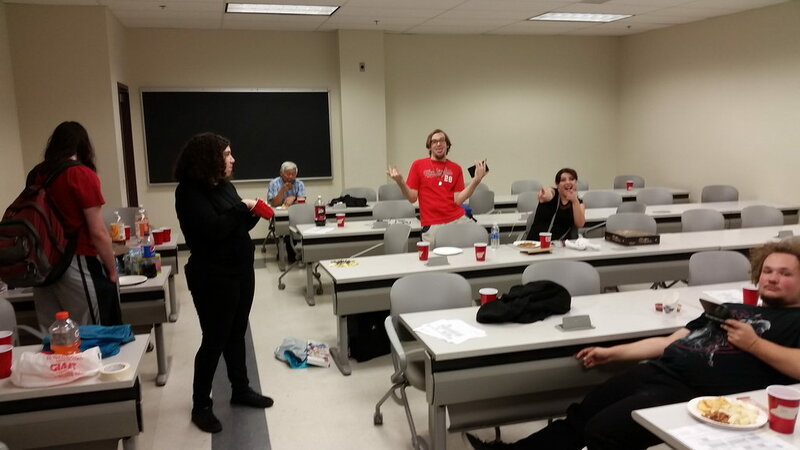 The Fall 2014 fest was held on Saturday October 25th, 2014 from 10:00 a.m. until 5:30 p.m. in Centennial Hall rooms 218, 244, and 245. The 2014 Spring Game Fest was held on Saturday February 15th, 2014 from 10:00 a.m. until 5:00 p.m. in Kehr Union Multipurpose A&B. This year we held our Game Fest in Kehr Union Multipurpose A&B. We thank everyone who was able to attend even with the inclement weather. The Fall 2013 fest was held on Saturday October 12th, 2013 from 10:00 a.m. until 5:30 p.m. in Centennial Hall rooms 218, 244, and 245. The 2013 Spring Game Fest was held on Sunday February 17th, 2013 from 10:00 a.m. until 5:00 p.m. in Kehr Union Multipurpose A&B. This year we held our Game Fest in Kehr Union Multipurpose A&B. Over a dozen people showed up to test their skills against other players. Thanks to all who attended. The Fall 2012 fest was held on Sunday October 14th, 2012 from 10:30 a.m. until 5:30 p.m. in Centennial Hall rooms 218, 244, and 245. The 2012 Spring Game Fest was held on Sunday April 1st, 2012 from 10:30 a.m. until 5:00 p.m. in Kehr Union Multipurpose A&B. The Fall 2011 fest was held on Sunday October 23rd, 2011 from 11:00 a.m. until 5:00 p.m. in Centennial Hall rooms 218, 244, and 245. The Spring 2011 fest was held on Saturday April 2nd, 2011 from 11:00 a.m. until 7:00 p.m. in Centennial Hall rooms 243, 244, and 245. The 2011 Spring Game Fest was held on Saturday February 12th, 2011 from 10:30 a.m. until 5:00 p.m. in Kehr Union Multipurpose A&B. The Fall 2010 fest was held on Sunday September 19th, 2010 from 11:00 a.m. until 8:00 p.m. in Centennial Hall rooms 218, 243, 244, and 245. The Spring 2010 fest was held on Sunday January 31st, 2010 from 11:00 a.m. until 8:00 p.m. in Centennial Hall rooms 218, 243, 244, and 245. The 2009 Fall Gaming Fundraiser was held on Saturday October 17th, 2009 from 11:30 a.m. until 8:00 p.m. in the Kehr Union Ballroom. 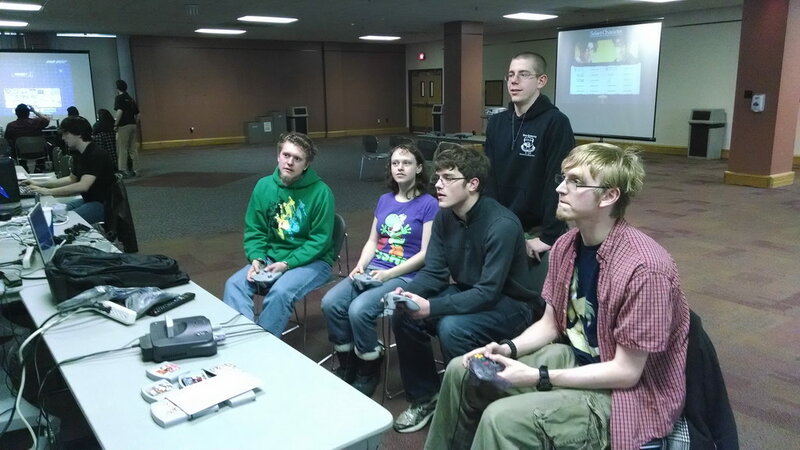 This year we held our forth annual Gaming Fundraiser in the Kehr Union Ballroom. Over 15 people showed up to test their skills against other players. Thanks to all who attended. The Fall 2009 fest was held on Sunday September 13th, 2009 from 11:00 a.m. until 8:00 p.m. in Centennial Hall rooms 218, 243, 244, and 245. Spring Film Fest 2009 II was held on Sunday March 22nd, 2009 from 11:00 a.m. until 8:00 p.m. in Centennial Hall rooms 218, 243, 244, and 245. The Spring 2009 fest was held on Sunday January 25th, 2009 from 11:00 a.m. until 8:00 p.m. in Centennial Hall rooms 218, 243, 244, and 245. The 2009 Spring Gaming fundraiser was held on Saturday January 24th, 2009 from 11:00 a.m. until 8:00 p.m. in the Kehr Union Multipurpose Rooms A & B. This year we held our first Spring Gaming Fundraiser. 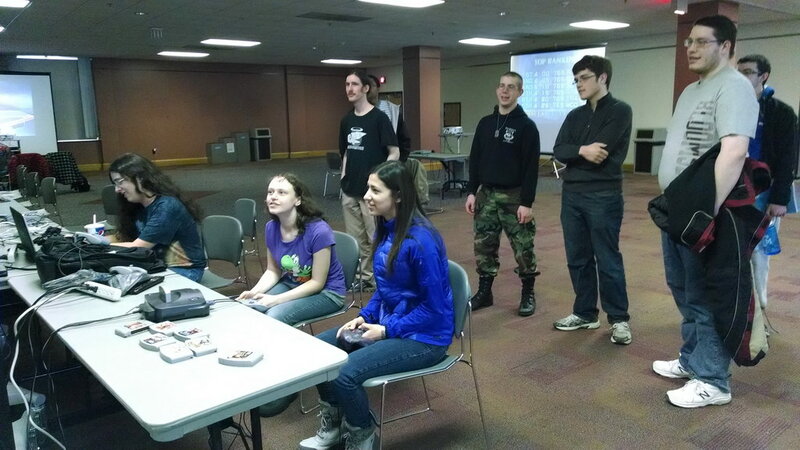 Over 15 people showed up to test their skills against other players in Super Smash Brothers Brawl and Guitar Hero. Thanks to all who attended. The Fall 2008 fest was held on Sunday September 7, 2008 from 11:00 a.m. until 8:00 p.m. in the Kehr Union Multipurpose Rooms A & B. This year we held our third annual Gaming Fundraiser in Multipurpose B. Over 20 people showed up to test their skills against other players. Thanks to all who attended. The Spring 2008 fest was held on Saturday April 5th, 2008 from 12:00 Noon until 8:00 p.m. in Centennial Hall rooms 218, 243, 244, and 245. The Fall 2007 fest was held on Saturday October 6th, 2007 from 12:00 Noon until 8:00 p.m. in the Kehr Union Multipurpose Rooms A & B. This year we held our second annual Dance Dance Revolution/Guitar Hero Fundraiser in Multipurpose B. About 15 people showed up to test their skills against other players. Thanks to all who attended. The Spring 2007 fest was held on Sunday April 1st, 2007 from 12:00 Noon until 8:00 p.m. in Centennial Hall rooms 218, 243, 244, and 245. Fall Film Fest 2006 II was held on Saturday November 11th, 2006 from 12:00 Noon until 8:00 p.m. in Centennial Hall rooms 218, 243, 244, and 245. The Fall 2006 fest was held on Saturday September 16th, 2006 from 12:00 Noon until 8:00 p.m. in the Kehr Union Multipurpose Rooms A & B. This year we also held a Dance Dance Revolution Fundraiser in Multipurpose B. About 20-30 people showed up to test there skills against other players from the area in a Double Elimination style match. Thanks for all who attended, for its first attempt it was a success. Congratulations to Mark our first place winner and Alex our second place winner. The Spring 2006 fest was held on Sunday March 5th, 2006 from 12:00 Noon until 8:00 p.m. in the Kehr Union Multipurpose Rooms A & B. 5. SPECIAL: Studio No.N.D.E. Fanfilms latest fandub, S.T.E.A.M! The Fall 2005 fest was held on Sunday, October 23rd 2005 from 12:00 Noon until 8:00 p.m. in Centennial Hall rooms 218, 243, 244, and 245.